Bald or not, she just looked beautiful! They did her hair and make up! I'm not crazy about make up for little girls, but that's the way things are. 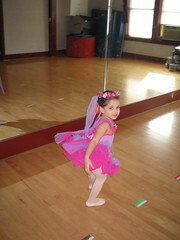 While waiting for picture time, she went into the studio and twirled around for me. Another picture day tomorrow for her second class. I can't wait to see the professional pictures! On the Moody front: Just peace and we're enjoying it! He had a play date with Jake last Saturday. Jake was his classmate last year; he moved on to kindergarten this year, but they still kept the connection. They have been talking about a sleepover for a while and telling us parents as a matter a fact, "We decided to have a sleepover this Saturday." That went on for many Saturdays. We opted for a play date for now--it was Jake's first! When I picked him up from Jake's house, his mom said that they had such a good time and played together really well. Moody is very good at playing with friends, and Jake is a good kid too. She said at one point Jake started crying because he knew "Moody will have to go home," and Moody put on a sad face because Jake was crying. 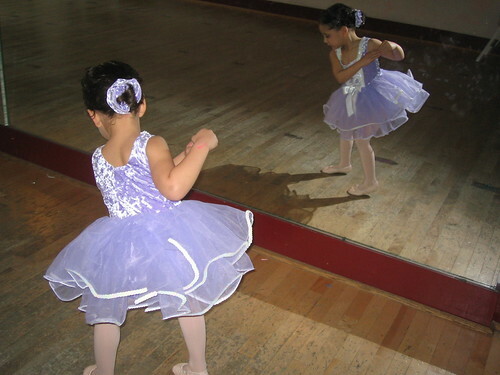 Tala looked beautiful in her ballet outfit. Almost makes me want to have another baby, lol! Maria, be ware! Girls are cute and sweet and they definitely tempt you to have more and more of them, but they do come with an ATTITUDE! And when attitude happens, brace yourself! mashaAllah ... Tala is sooo cute and such a personality it seems :)...ma3lesh about the bald spot she probably did it herself beysh ettayyer el3ayn...Tala herself is cute...but Tala and her reflection :) too much cuteness. I was wondering what Tala meant? Is it an Arabic name?